The Apollo Theater is pleased to announce upcoming Amateur Night auditions in Philadelphia, Pennsylvania. Amateur Night producers will tap into the considerable talent in the City of Brotherly Love to audition to compete in the current season in Harlem, NY. Auditions for Amateur Night will be held in Philadelphia on Saturday, July 27th, beginning at 10 am. This marks the first time Amateur Night auditions will be held in Philadelphia. Auditions are open to all vocalists, dancers, comedians, spoken word artists, and other performers trying to win a coveted spot on the Apollo’s stage. Another round of auditions for Amateur Night’s 2013 season will be in New York City on Saturday, August 3rd for gospel talent. Auditions for APOLLO LIVE will be held in Washington, D.C. at Howard University on Saturday, July 13th; in Atlanta, GA at Center Stages on Sunday, July 14th; and in New York City at the Apollo Theater on Saturday, July 20th. APOLLO LIVE music experts, Doug E. Fresh and Michael Bivins, APOLLO LIVE producers and Amateur Night producer Marion J. Caffey, will screen hundreds of vocalists, dancers, comedians, spoken word artists, and other performers trying to win a coveted spot on the Apollo’s stage. Since its inception in 1934, Amateur Night has been one of New York City’s most popular live entertainment experiences, launching the careers of thousands of performers and attracting audiences from all over the world. The Apollo Theater’s Amateur Night has long been revered by artists as a transformative experience where up-and-coming talent feels the power of the legendary performers who have come before them, and where audience response can help make or break a career. Through its partnership with the Coca-Cola Company, Amateur Night was revamped at the beginning of the 2010 season and features several new programmatic elements including theme nights, a DJ driven pre-show party and, of course, the expanded auditions. These specialized auditions are a part of the Theater’s plans to raise the level of talent for the show, which has launched the careers of countless stars from Ella Fitzgerald to James Brown to Stevie Wonder. APOLLO LIVE is a fresh take on the competition genre. Hosted by comedian Tony Rock, the series brings an array of undiscovered talent and musical performances from some of R&B’s biggest stars each week. The show is taped in front of a live audience at the Apollo Theater, and includes audience voting as well as the notorious “Executioner,” who sweeps unsuccessful performers off the stage. Similar to the Apollo’s live Amateur Night show, the contestants’ fate will be in the hands of the audience, whose cheers and jeers decide the winner. There’s no shortage of star power as soul legend Gladys Knight, hip hop pioneer Doug E. Fresh and R&B great Michael Bivins critique an array of budding talent as the series’ music experts, providing feedback and commentary on the performances. For Amateur Night auditions, judges will only see the first 300 acts if time permits, so please arrive early. Amateur Night at the Apollo weekly performances are independent from the APOLLO LIVE and SHOWTIME AT THE APOLLO taped events. *Important Note: ALL APOLLO LIVE applicants must complete and print their online application. APOLLO LIVE auditions are open to U.S. citizens or legal residents who are at least 18 years old and not considered a minor in their state of residence. Applicants may complete the application and additional audition details by visiting www.BET.com/Apollo. The Apollo is a national treasure that has had significant impact on the development of American culture and its popularity around the world. Since introducing the first Amateur Night contests in 1934, the Apollo Theater has played a major role in cultivating artists and in the emergence of innovative musical genres including jazz, swing, bebop, R&B, gospel, blues, soul, and hip-hop. Ella Fitzgerald, Sarah Vaughan, Billie Holiday, Sammy Davis, Jr., James Brown, Michael Jackson, Bill Cosby, Gladys Knight, Luther Vandross, D’Angelo, Lauryn Hill, and countless others began their road to stardom on the Apollo’s stage. Now, as a nonprofit arts institution, the Apollo Theater’s new artistic vision builds on its legacy. New Apollo programming has music as its core, driving large scale and more intimate music, dance and theater presentations. 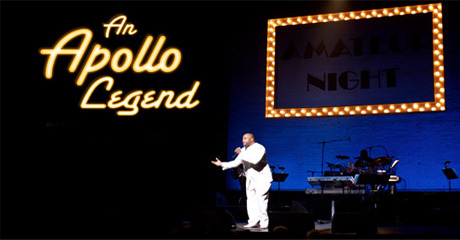 The Apollo will continue to present historically relevant presentations, as well as more forward-looking, contemporary work.Based on its cultural significance and architecture, the Apollo Theater received state and city landmark designation in 1983 and is listed on the National Register of Historic Places. For more information, visit www.apollotheater.org. Created by Ralph Cooper as a live version of his radio show “Amateur Nite Hour,” Amateur Night at the Apollo has occurred virtually every Wednesday night since the Theater opened in 1934. Long before Ted Mack and the Amateur Hour and American Idol, Amateur Night was the place to discover up-and-coming talent, and the show has launched the careers of countless performers, including James Brown, Stevie Wonder, Lauryn Hill, Dionne Warwick, Michael Jackson and The Jackson Five, Billie Holiday, Luther Vandross, MGK, Gladys Knight & the Pips, and Sarah Vaughan. As artist after artist rose from Amateur Night to stardom, the Apollo’s notoriously vocal and opinionated audience became known for its ability to make or break careers with its cheers and boos. Contestants rub the “Tree of Hope” for good luck before their performances, and those who fail to win over the crowd are swept off the stage by the infamous “Executioner.” The Apollo’s signature talent competition continues to attract aspiring performers and visitors from all over the world, and remains one of New York City’s most popular live entertainment experiences. In February 2012, the Apollo launched Amateur Night Digital, an interactive website and mobile app that enables fans worldwide to track the progress of and vote for their favorite Amateur Night contestants. BET Networks, a subsidiary of Viacom Inc. (NASDAQ: VIA, VIAB), is the nation’s leading provider of quality entertainment, music, news and public affairs television programming for the African-American audience. The primary BET channel reaches more than 90 million households and can be seen in the United States, Canada, the Caribbean, the United Kingdom and sub-Saharan Africa. BET is the dominant African-American consumer brand with a diverse group of business extensions: BET.com, a leading Internet destination for Black entertainment, music, culture, and news; CENTRIC, a 24-hour entertainment network targeting the 25- to 54-year-old African-American audience; BET Digital Networks – BET Gospel and BET Hip Hop, attractive alternatives for cutting-edge entertainment tastes; BET Home Entertainment, a collection of BET-branded offerings for the home environment including DVDs and video-on-demand; BET Event Productions, a full-scale event management and production company with festivals and live events spanning the globe; BET operates BET in the United Kingdom and oversees the extension of BET network programming for global distribution. The Apollo’s 2013-2014 season is made possible by lead support from The Coca-Cola Company, Folonari Wines and Cavicchioli 1928, the Ford Foundation Fund for Global Programs, The Parsons Family Foundation, the Ronald O. Perelman Family Foundation, JoAnn Price, Reginald Van Lee New Works Fund, Rockefeller Cultural Innovation Fund, The Peter Jay Sharp Foundation, Earl W. and Amanda Stafford, Time Warner Inc., the Upper Manhattan Empowerment Zone, the Apollo Board of Directors and many other generous donors. Lead annual support is also provided by public funds from the New York State Council on the Arts with the support of Governor Andrew Cuomo and the New York State Legislature, the National Endowment for the Arts, and the New York City Department of Cultural Affairs in partnership with the City Council.